A simple life truly begins when we make the decision to declutter our homes. Once you’ve decluttered, it’s so much easier to organize what’s left. Here you’ll find step-by-step tutorials, encouragement, and (judgment-free) advice to help you with decluttering your home. 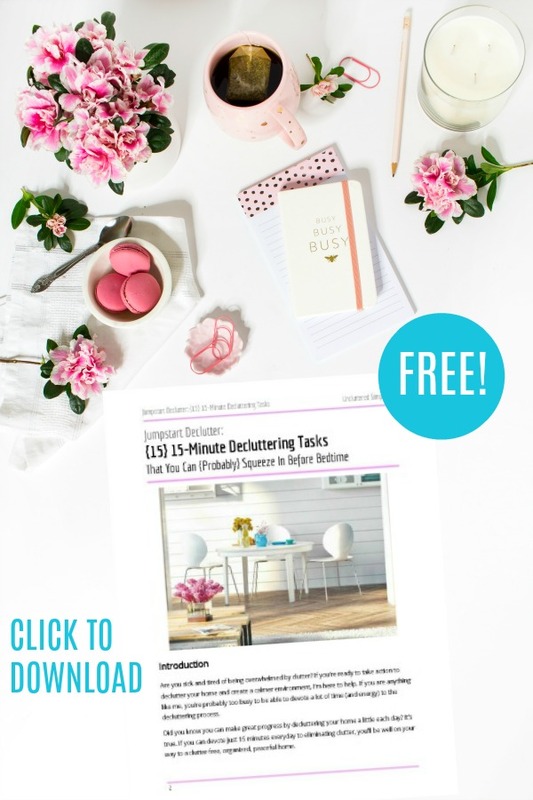 Get the free guide to decluttering your entire home in just 15-minutes a day. As the old saying goes, “There’s more than one way to skin a cat!” Ewww. Gross. Seriously, though. There’s no one right way to declutter your home, you need to find the method that works for you. Sometimes, a combination of decluttering methods works, too. What is ‘Death Cleaning’? And When Should You Start? One of the best places to start decluttering is with your clothes. For the most part, we aren’t sentimentally attached to our clothes, so the closet is a good place to begin. Also, most of us own way too many clothes! Amiright? Use the information in these posts to help you declutter your clothes. Once you’ve decided on the method you will use to declutter your home, it’s time to put those methods into practice. It’s entirely possible that, no matter how hard you try, you just can’t seem to declutter your home. Maybe you’ve started decluttering only to find that your efforts have fizzled out. Here’s a little encouragement to help you get back on track. Could You Be A Hoarder And Not Even Know It? Let me tell you from experience, keeping a decluttered home clean is WAY easier than trying to clean a cluttered home! *Pin this post and check back regularly. New posts are being added all of the time!